When Directors & Boards published my article, “Boards Can’t Ignore the Lure of the Flexible Workplace,” it positioned work flexibility as a strategic imperative that board level leaders needed to understand, pay attention to and support. The insight to put work flexibility more clearly on the radar of directors belongs to Eve Tahmincioglu, the Executive Editor of Directors & Boards, who said, “Let’s do this” when I first brought our survey results to her attention. I recently interviewed Eve to learn more about the gaps she sees in the board’s knowledge of work flexibility, its potential bottom line impact, and the board’s role in effective implementation. 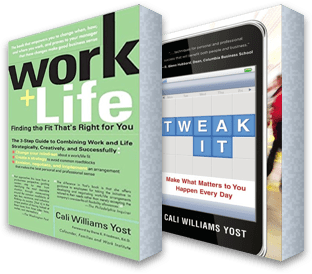 Cali Yost: Why was it important to include an article about work flexibility in this issue of Directors & Boards? Eve Tahmincioglu: If we’re going to have a conversation about getting the best and brightest, you have to talk about work flexibility. That’s why we are addressing it. Everybody is talking about the war on talent. We hear it over and over again and the discussion is the same: make your company great, have a good reputation, how do we get the younger generation to come on board, etc. Having covered the workplace and flexibility as a reporter and then at a non-profit, the topic is just part of my DNA. When I think about what attracts the best employees, you have to create a workplace where they can thrive at work and at home. It’s something that’s been important to me for many years. But coming here and becoming Executive Editor of Directors & Boards, I noticed that work flexibility was not really part of the talent discussion. Why? The majority of people in corporate boardrooms today are men typically over 55, with an average age somewhere in the 60s. They have an idea of what the workplace should look like, and it doesn’t really jive with how the workplace has changed in terms of flexibility. I thought we really need to talk to directors specifically about flexible workplaces and how you attract employees to your company and then keep them.